This month’s spotlight shines on Carla Smith (@carlamsmith), EVP of HIMSS and host of this month’s #healthITchicks tweet chat on November 16 at 1pm ET. Carla is no stranger to tweets – she fills three bird feeders on a daily basis at the Midwestern home she shares with her husband, daughter, and two cats (both of which have probably elicited their fair share of tweets, too). Carla counts female empowerment, especially as it relates to education and career, and civil rights among the causes near and dear to her heart. It’s no surprise, then, that her favorite social networking communities are those that revolve around #WomenInHIT and #healthITchicks. Like many spotlight interviewees, Carla is a voracious reader. She counts her newsfeed as her favorite app, and “A Brief History of Nearly Everything” by Bill Bryson, “On Writing” by Stephen King, “Cross Creek” by Marjorie Kinnan Rawlings, and selected essays from “The Points of My Compass” by E.B. White as among her favorite books. Never one to shy away from multitasking, she is currently working her way through “This Republic of Suffering: Death & The Civil War,” by Drew Gilpin Faust and “Coal: A Human History” by Barbara Freese. While not the lightest of reads, they no doubt help Carla momentarily escape from the world of healthcare IT. How have you seen women make a difference in health IT during your time in the industry? Is there one woman in particular whose contributions have stood out? So many women have made substantial contributions over the years; it would be not only wrong to single one woman out – it would be impossible. Since I entered the health IT field, women have been members of the Boards of Directors of health IT non-profit organizations (including, but not limited to, HIMSS) and strong contributing volunteers. Women have been integral to the field. As women, oftentimes we serve as the health champions for our families. As health IT professionals, we convey that real-world experience; we are the human “bridges” that can bring high-value IT to the market and into the hands of clinicians, patients, and consumers. Do you feel that the industry is where it needs to be in terms of offering equal advancement/leadership and mentorship opportunities? No. I was stunned when the longitudinal assessment of HIMSS’s compensation study (2006-2015) showed that the pay gap between male and female compensation had broadened. But, I hasten to add that there are many signs that point to a positive future. Most recognize the value and importance to a business’s success to pay equitably, and to recruit/retain a diverse staff of highly-competent professionals. It’s so important to have the conversation, do the research, and take action. What organizations and resources do you follow that have helped you professionally, especially with regards to being a female health IT professional? HIMSS is at the top of my list. Through my work at HIMSS, I have been profoundly blessed to meet and grow close to many extraordinary men and women who have helped me. What gender workplace topics have resonated with you over the last year (wage gap, work/life balance, parental leave/benefits, the role of men in supporting women, etc.)? What are you looking forward to chatting about during the #healthITchicks tweetup on November 16? Networking, with suggestions on groups to engage with. Creating relationships with colleagues is part of the “secret sauce” of a fulfilling career. I want to share ideas with others so that they, too, can benefit from strong and collaborative relationships. Volunteerism. I’d like to highlight that your voice does make a difference, and that your involvement can change and improve the world around you. Diversity – why having a diverse workforce matters in heath IT. Strengthening your competency. Ongoing professional development is profoundly important. Lifelong learning enables us to keep our minds active and fresh; we can learn new ways of thinking, new concepts to consider, and obstacles to avoid. Embracing your femininity. Our innate approach, which has been historically overlooked and disdained, has high value in the business world. 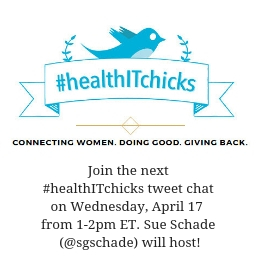 Join me (@JennDennard) and Carla Smith (@carlamsmith) for the next #healthITchicks chat on Wednesday, November 16 at 1pm ET. You can also connect with us on LinkedIn via the #healthITchicks group.